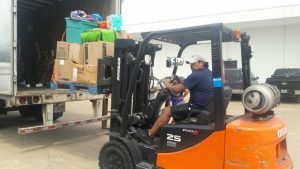 Last week, AFP Global Logistics helped collect donations to assist the victims of hurricane Harvey in Houston. The devastation wrought by Hurricane Harvey in Houston is truly mind-boggling. In some isolated areas, more than fifty inches of rain fell – for context, this is more rain than falls on the city of Chicago in an entire year! And across the state of Texas, meteorologists estimated that the hurricane dumped approximately 15-20 trillion gallons of water. The human impact of the storm has also been felt keenly. More than ten thousand local Houstonians had to take shelter inside the city’s convention center, one small portion of the displaced population. 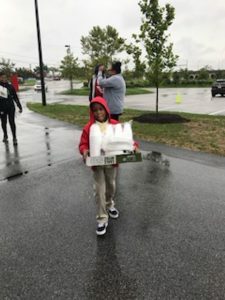 Last week, AFP Global Logistics partnered with Sagamore Development, Under Armour, and Restoring Inner City Hope to collect items for “Baltimore’s Blessing Truck to Houston”. Read on for more information and pictures from the event. 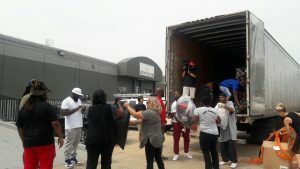 The generous contributions of the community here in Baltimore completely filled a trailer in the course of twelve hours. 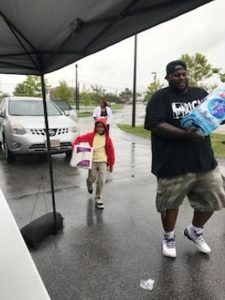 Organizers of the event asked for donations of necessary commodities such as bottled water, diapers, wipes to be used for bathing, feminine hygiene products, underwear, and other toiletries. This trailer left the city en route to Houston on Monday and arrived on Wednesday. 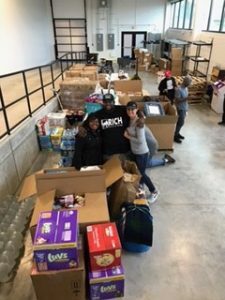 The company receiving the trailer, Creative Group Economics, has been collecting relief supplies on behalf of the victims of Hurricane Harvey since the disaster struck. 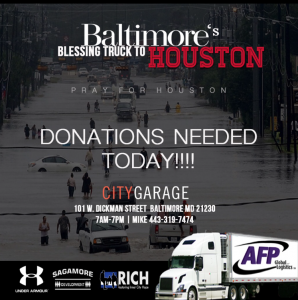 We here at AFP Global Logistics are praying for the victims of Houston and want to thank everyone who came out to CityGarage last week to contribute to the trailer. 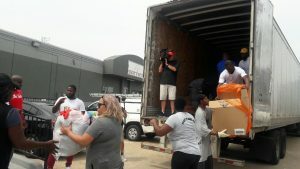 We also want to send thanks to our project partners Sagamore Development, Under Armour, and Restoring Inner City Hope, as well as a special thank you to Marc Houlas and Amark Logistics for sending the truck to Houston! The flyer advertising collections for the victims of Hurricane Harvey, which took place last week. This entry was posted on Friday, September 15th, 2017	at 1:21 pm	and is filed under News	. You can follow any responses to this entry through the RSS 2.0	feed. Both comments and pings are currently closed.